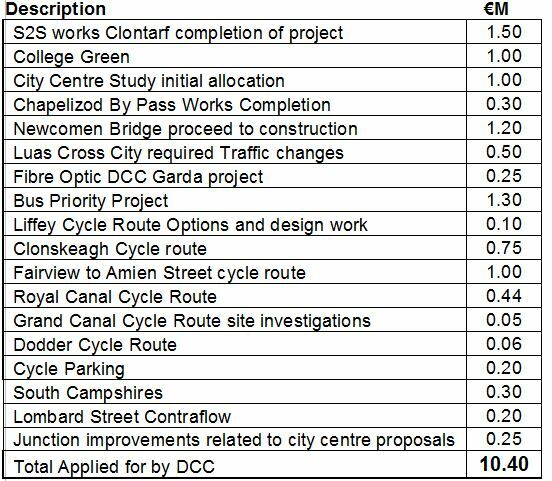 Over €10 million is to be spent on planning and construction of transport projects in the Dublin City Council area in 2016 — cycling features heavily but the funding is spread across many projects, and a large amount are still at design stage. The funding was outlined in a short report to the council’s transport committee. Most of the projects in 2016 are long-expected ones, including €1.5m for the completion of S2S works at Clontarf; €1m for work at College Green; €1.2m on the construction of a pedestrian add-on bridge at Newcomen Bridge on North Strand Road to allow for space for the Fairview / Clontarf cycle route; and €0.10m on the Liffey Cycle Route options and design work. Other cycle route funding includes €0.75m for the Clonskeagh cycle route, which is a route from College Green to Clonskeagh. It covers Georges Street, Camden Street, Ranelagh and links into the Clonskeagh Road at the back of UCD. This route is still at design / consultation stage. Funding of €0.44m is planned to be used for the Royal Canal Cycle Route; and €0.05m on site investigations for an extension of the popular Grand Canal Cycle Route. A contra-flow cycle lane or path is planned for Lombard Street — this would link Westland Row to the under construction two-way cycle path on the south quays campshires in the Docklands (which in turn links with a little known northbound contra-flow route over the Talbot Memorial Bridge and along the Customs House to Busáras). The projects and level of funding detailed above and in the below table is in the indicative NTA 2016 Capital Funding for the Dublin City Council area. It excludes projects funded using other sources and projects in other council areas. Is this actual money committed to projects? If so, this is great news, with actual construction taking place in 2016. Also good to see plans develop on a range of potential infrastructure projects. Not 100% confirmed as it is an indicative outline of the budget. As for construction — as noted in the article much of the money is for design and planning work. Ranelagh through Clonskeagh is very bad for cars (illegally) undertaking right turners by using (mandatory) cycle lanes often just ahead of or on top of cyclists. Also cars merging into the cycle lane to give space to oncoming traffic who have merged to the centre to give space to cars parked in poorly thought out parking bays. Ranelagh and Clonskeagh actually has some decent space allocated to cycle lanes but with no protection or intelligent junction design the conflicts are numerous. Yellow boxes designed to facilitate right turns need to be extended further beyond the junctions to provide visibility for both cyclists and oncoming right turners. This is a simple matter of paint and recognition of the need to facilitate safe road use for all parties. Add to that the lack of protection from undertakers and (poorly thought out) legal and illegal parking from public, businesses and delivery vehicles and it is an area full of conflict. However speaking to a local business owner I suspect that real infrastructure will be a hard sell with businesses on Ranelagh’s congested main street, which already has more parking than is reasonable, angry that their customers cannot (legally) park in front of their businesses at all times and angry that nearby residents must park their cars a street or two over from their house. Unfortunately this anecdote suggests the sense of entitlement of motorists to park where they want (and indeed to possess the public road outside their houses) runs deep and much political will shall be required to secure significant safe infrastructure without severely compromised designs.